Background: Heavy metal pollution in the environmental samples like soil, water and runoff water is a worldwide problem. Such contamination of environmental matrices by the heavy metals accumulates due to various activities involving human driven sources and industries, although agriculture and sewage disposal are the largest source for the heavy metal contamination. Disposal of heavy metals or waste products containing heavy metals in the environment postures a trivial threat to public safety and health. Heavy metals are persistence and they can also cause biomagnifications and accumulate in food chain. Method: Microbial bioremediation of heavy metal is emerging as an effective technique. Microbial bioremediation is a highly efficient environmental friendly procedure which also reduces the cost of cleanup process associated with heavy metal contamination. New methods for removal of heavy metals from the environmental samples are under development and most recent advancements have been made in exploring the knowledge of metal-microbes interactions and its use for heavy metal remediation. 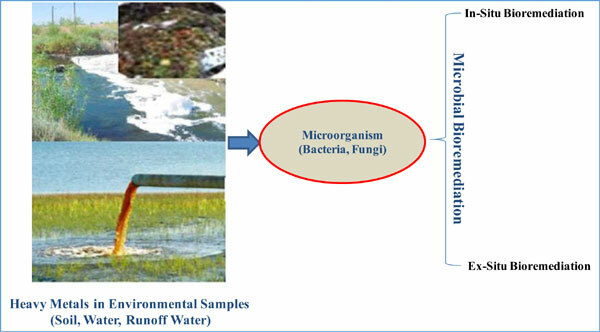 Conclusion: This review paper will focus on the microbial bioremediation process and highlight some of the newly developed patented methods for microbial bioremediation of the heavy metals from the environmental samples using microbial populations. Detoxification, environmental matrices, heavy metal contamination, industrial waste, microbial bioremediation, microbial population.